Unlock Alexa skills that can help children explore, innovate and create. As technology is increasingly becoming accessible, families are seamlessly integrating it into their lives. Children are getting smarter with the technology around them by learning and understanding gadgets faster than their parents. Earlier, learning was primarily based on traditional methods like books; however, today most parents prefer opting for a 360-degree approach giving audio-visual and tactile learning equal importance. Empowering curiosity and encouraging faster learning abilities, everyday, unlock Alexa skills that can help children explore, innovate and create. Engage your kid with the best interactive experience featuring India's most popular hero, Chhota Bheem. 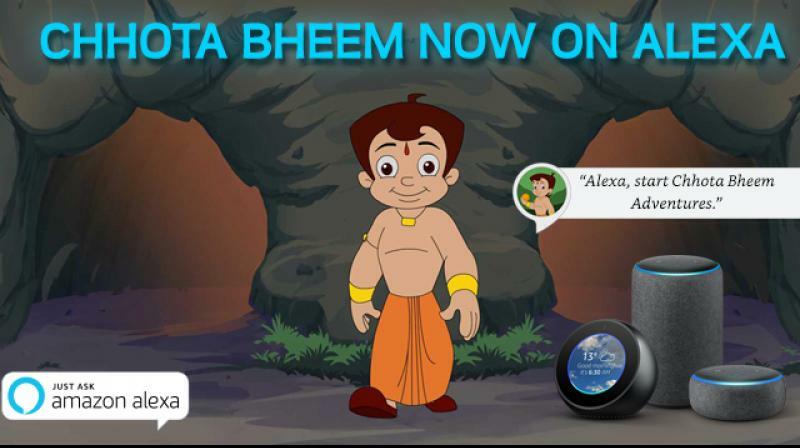 The Chhota Bheem Adventures skill for Alexa is a game which lets children immerse themselves in the world of Dholakpur. The experience is not just limited to original voices of Chhota Bheem and friends but also has enough sound effects and visuals to directly teleport the audience to Dholakpur. Just Say, “Alexa, Open Chhota Bheem Adventures” and set off on a mission to explore the caves which have recently been unearthed in Dholakpur with Chhota Bheem. Indulge your kids in an interactive and adventurous ride of King George’s hidden treasure. This adventure encompasses a Royal Treasure map, exploring through the Wild Forest, interacting with friendly animals and humans, overcoming obstacles and learn fun facts from Mike throughout the adventure. Just Say, “Alexa, Open Forest Fortune” and take your kid through a royal adventure to hunt for King George’s hidden treasure. Introduce your kid into the fun and interactive world of Panda Wilderness School. In the game, Kids get to be the assigned caretaker of an orphan baby panda and teach important life lessons by making the right choices as they move through the game. Just say, “Alexa, open Panda Rescue”. Make learning fun with Playablo, a gamified learning app. featuring thousands of short 7-question quizzes, Playablo helps your child identify his or her strengths and improvement areas and the robust feedback system will help you keep track of your child’s progress. It also features several gameplay elements like points, leaderboards and peer-to-peer competition that will help your child retain what he or she learns in school. Just say, “Alexa, open Playablo” and help your child rediscover the joy of learning. Based on themes and rhymes from Appu's world, this interactive skill is designed to help develop and improvise listening, comprehending and problem-solving abilities in children. Just say, “Alexa, open Appu's Adventures” and let your kid experience the interactive world of Appu’s adventures.